I loved this box set of quick romances! Each of these stories are about curvy, independent women finding strong men who appreciate them. Jenn wrote wonderful stories in short page counts. She somehow told everything needed to make them super entertaining reads. I really liked the story lines and especially the characters in these books. 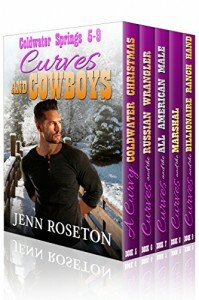 These romances are western themed and each can be read in about an hour so if you're looking for sweet little romances, this set is perfect.